Phillips coarse (USS) pan head machine screws are made of zinc-plated steel which allows for a moderate amount of corrosion resistance. Phillips Pan Heads have a rounded top, cylindrical sides and a flat bearing surface for any area that requires general purpose bearing. Pan Head screws can be substituted for round, truss, or binding heads in most applications. Machine screws are most often used with a nut as a means of tightening unless they have a pre-threaded hole with the exact thread pitch. These screws are most commonly offered in smaller sizes. 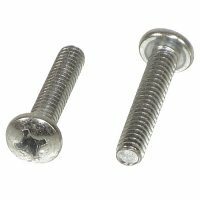 Other types of machine screws sold at NutsandBolts.com are: phillips flat head machine screws, stainless steel flat head machine screws and phillips round head machine screws. Phillips head machine screws are the most recommended type of drive. A phillips drive offers more control and less slippage.